The Pro 80 was the first Hotshot light to add a diffusing lens. This spreads the beam out horizontally, using the light more efficiently by shining less into the sky and onto the ground. On steady mode, the maximum brightness is 50 lumens, and in some flashing modes it can go as bright as 80 lumens. In steady mode you can adjust the brightness, and in flash modes you cannot change the brightness but can adjust the flash rate. Many people recommend having two taillights; one which is flashing to grab attention, and a second non-flashing light which is easier to focus on and judge distance and speed by. The new Hotshot lights feature Cygolite's "steady pulse" pattern which has been available on their headlights for a few years. The light is always on at a low brightness, and bursts a few brighter flashes periodically. With the Cygolite's flash pattern adjustment button you can actually change how often these pulses come. I really like this flash pattern, as it combines the benefits of both flashing and steady lights. I personally still ride with two taillights at night, but would be feel fine using just the Hotshot Pro 80 alone. Daytime safety gets some attention with the new Hotshot lights as well. With some flash patterns now blasting up to 80 lumens, the light is visible even on bright sunny days. Battery life on the Hotshot Pro 80 is excellent. The light lasted 2:45 hours on its highest steady setting at 50 lm. Due to the adjustable intensity in steady mode and flash rate in other modes, it's possible to get an insanely long battery life depending on how you configure the life. I've never needed to charge it more than once per week, even with daily usage at a fairly high flash rate. The Hotshot does lack a separate battery indicator light, which can be annoying when trying to decide when to recharge. Additionally, the Hotshot still uses mini-USB charging, even though most USB-rechargeable lights now use the more common micro-USB. No fast charging is available either, meaning you'll need to leave the light plugged in overnight to get a full charge from empty. The Hotshot 80 Pro uses the same mount as its predecessors. Plastic clamps are provided in two diameters; one suitable for seatposts and one for seat stays. A plastic bracket screws into either clamp, and the light simply slides into the bracket and clicks into place. The mount is very stable. Separate screws adjust the tightness of the clamp and the angle of the bracket. 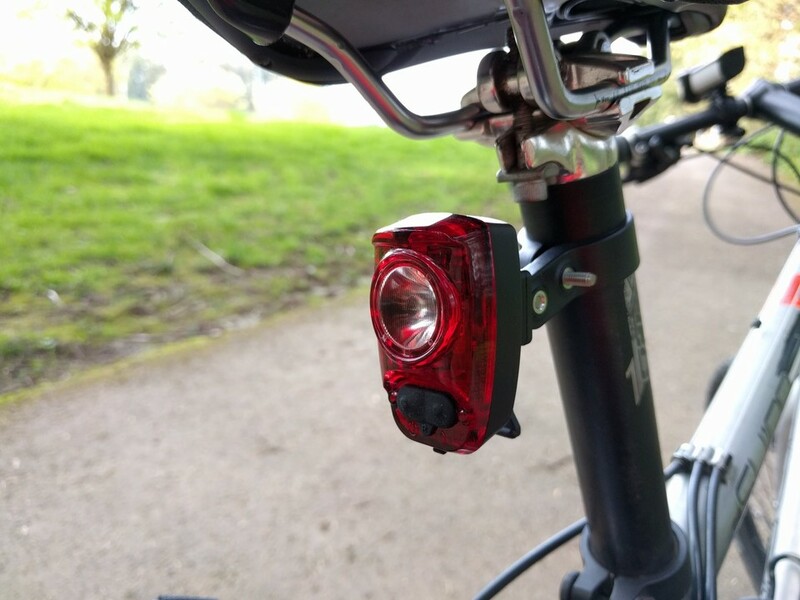 With both screws tightened down, the light remains level even when riding over jarring terrain, and I've had no problems with the light popping out of the mount. An optional rack mount is available online too; a good choice for people with cargo racks. Controlling the light is relatively straightforward with two buttons. The left button turns the light on/off with a press-and-hold, and cycles between modes with a quick single press. In steady mode, the right button adjusts the brightness – ranging all the way from a full 50 lumens down to a barely-visible level. This flexibility is great, although it's not as quick to adjust as simply having multiple brightness levels as separate modes. When riding on a multi-use path at night I'll set the light to a very dim steady mode to conserve battery and avoid blinding other riders. When I get back into traffic, I'll crank the brightness back up. In all of the flashing modes the right button adjusts the flash frequency, and does not affect brightness. Pressing and holding the button will gradually slow down the flash rate. Releasing the button, then pressing and holding again, increases the flash rate. A slower flash rate will give you longer battery life, and makes the light a bit less distracting (but perhaps also less noticeable) to motorists. For the most part I leave the flash speeds on their defaults. Personally, I'd prefer being able to adjust the brightness level on all modes rather than the flash speed. Overall the Hotshot Pro 80 is an excellent evolution of the Hotshot family. The Hotshot series continues to offer high-quality products at very competitive prices. 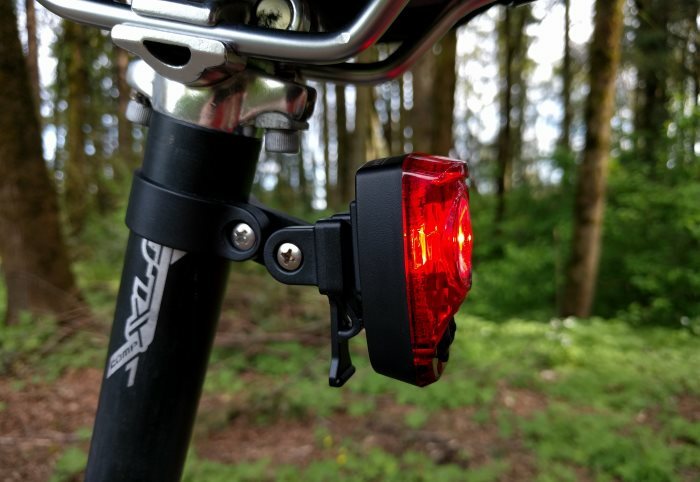 The Hotshot Pro 80 handily wins the position of best taillight under $50, and even surpasses numerous more-expensive lights in terms of performance and quality.